Beans are nutritional powerhouses, providing extensive amounts of minerals while being low in fat. They may also help lower your risk for obesity, heart disease, cancer and diabetes, according to North Dakota State University Extension. While pork and beans are not quite as nutritious as plain dried or canned beans due to their higher fat, cholesterol and sodium content, they still provide lots of essential nutrients. Adding a side consisting of a cup of pork and beans to your plate will increase the calorie content of your meal by 268. You'll get an extra 13.1 grams of protein, 50.6 grams of carbohydrates and 3.9 grams of fat, including 1.5 grams of saturated fat. This is 6 percent of the recommended limit for total fat and 8 percent of the recommended saturated fat limit for the day if you follow a 2,000-calorie diet. Pork and beans also provide a small amount of cholesterol, with 8 milligrams per cup. Each cup of pork and beans contains 13.9 grams of fiber, or 56 percent of the daily value for this essential nutrient. Fiber helps lower your cholesterol and your risk for heart disease and digestive complaints such as hemorrhoids, diverticulosis and constipation. It helps you feel full for longer, making it easier for you to maintain a healthy weight. A serving of pork and beans also boosts your intake of folate, providing 23 percent of the daily value. You need folate for forming DNA and for proper cell division. Pork and beans really shine when it comes to mineral content. Each 1-cup serving provides 46 percent of the DV for manganese, 13 percent of the DV for calcium, 17 percent of the DV for selenium and more than 20 percent of the DV for iron, potassium, magnesium, zinc, phosphorus and copper. Manganese and calcium help you form strong bones; selenium and magnesium help with the formation of DNA; and iron, copper and phosphorus help form red blood cells to carry oxygen in your body. Potassium is essential for blood pressure control, and you need zinc for proper immune function. 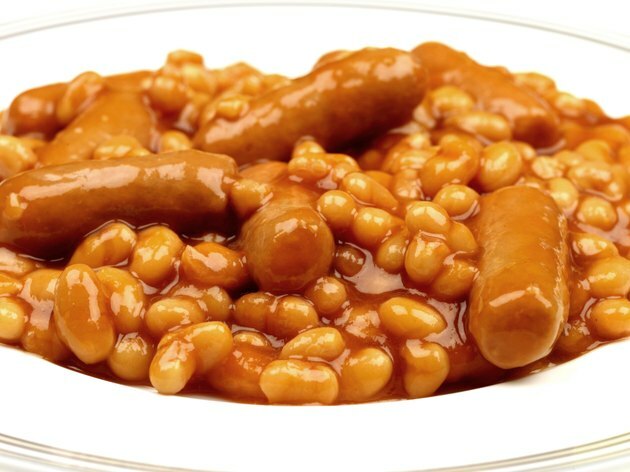 Pork and beans shouldn't be your only source of beans, however, since they are high in sodium. Each 1-cup serving contains 1,047 milligrams of this mineral, which can contribute to high blood pressure in sensitive individuals. Limit your daily sodium intake to 2,300 milligrams if you are healthy or 1,500 milligrams if you are at increased risk for high blood pressure or heart disease.